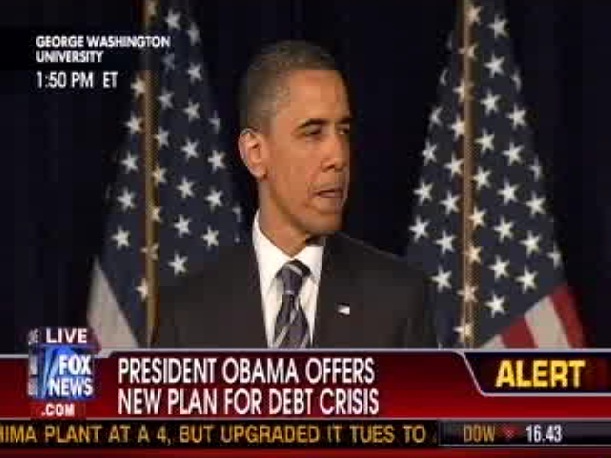 President Obama appeared at George Washington University today, to make a speech on his plan to fix the deficit. This oxymoron is striking, as Obama has quadrupled the debt, created gigantic entitlement programs and proposed a budget for 2012 with even more spending. President Obama does not have an ounce of credibility to lecture us on “living within our means”, when he has out spent every U.S. President since George Washington. Obama setup his argument by essentially blaming the current situation on the last three Presidents and Congress. Then he offered to stick to the traditional Democratic policy of even more taxes and bigger spending. Chalk this up as another one of Obama’s campaign speeches in this never ending cycle that he began in 2007. Keeping with his persona of being a demagogue by attacking and belittling, he of course blamed the “billionaires and millionaires” for not paying more because of the Bush Tax cuts. Then he resorted to fear mongering by stating that seniors and the middle class would suffer under any Republican budget plan. “It’s a vision that says America can’t afford to keep the promise we’ve made to care for our seniors. It says that ten years from now, if you’re a 65 year old who’s eligible for Medicare, you should have to pay nearly $6,400 more than you would today. It says instead of guaranteed health care, you will get a voucher. And if that voucher isn’t worth enough to buy insurance, tough luck – you’re on your own. Put simply, it ends Medicare as we know it. Obama, then lied by stating that his health care bill would reduce our deficit by one trillion dollars. This talking point has been debunked by the CBO, because the projection is over 20 years, in fact, ObamaCare will only get us a $143 billion reduction over the next 10 years. I call this Obama’s second State of the Union Address, where he politicized instead of offering any substantive means of reducing this nation’s debt. Nothing new here, another opportunity for blowing smoke and wasting our time, to just tell us that he’s holding to his original campaign rhetoric and proposed 2012 budget plan. Obama used this speech to essentially frame what his 2012 Presidential election campaign will be all about and also give a warning to members of his own party to follow him over the cliff. President Obama’s 2012 campaign slogan is “Winning The Future”. The United States can definitely win the future by soundly defeating Barack Obama and all the Democrat incumbents. UPDATE: Charles Krauthammer said it perfectly on Fox News, here.